In Dublin’s Muirfield Village, a TimberTech deck is perfect for this golf course community living. This journey has came to fruition, with a quality built and stunning new deck for these homeowners in Muirfield village in Dublin, OH. 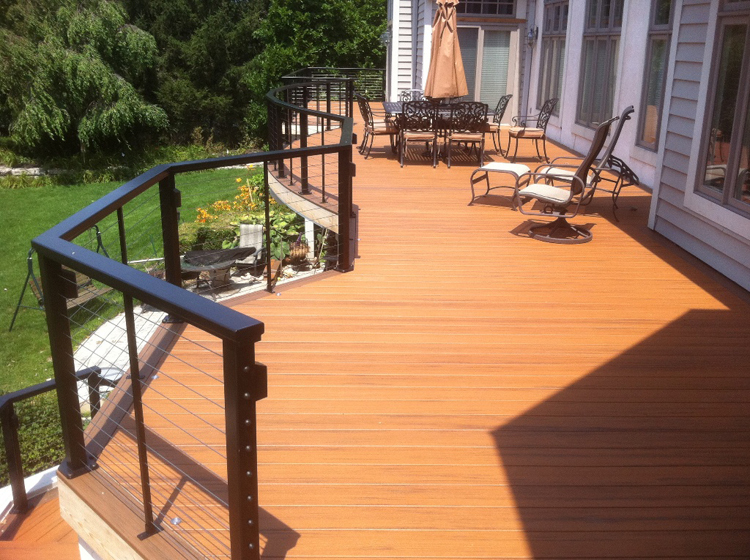 We leave these homeowners with peace of mind that their new deck will last for many years of enjoyment. If you’ve had the chance to visit Muirfield Village in Dublin OH, perhaps for Memorial Golf Tournament, you’ve experienced the calming serene atmosphere that extends past the courses and up into the homes. I remember attending one of the tournaments a few years back and noticing the way the homes seemed to fit right into the course. They were a nice distance from the course but the HOA also did a great job to establish guidelines for construction that would ensure the architecture of the homes and any home additions continued the peaceful interplay between the residences and the serene setting. The use of the Feeney cable railing opens up the glorious vistas of the golf courses, as well as the pond. Now if you’ve attended the Memorial Golf Tournament a couple of times, you probably brought a rain coat and an umbrella with you each time. In reality, the Muirfield homeowners don’t live under the cover of rain. But, homeowners anywhere with a nice elevated deck are wise to utilize an under deck drainage system that allows the area under the deck to serve as a very functional dry covered patio. 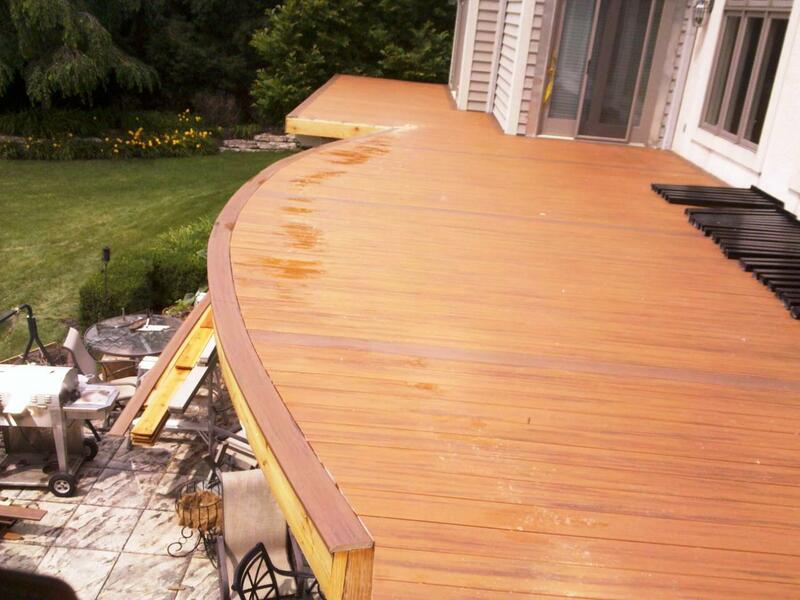 This photo shows the beautiful details of this finished TimberTech deck by Archadeck of Columbus. 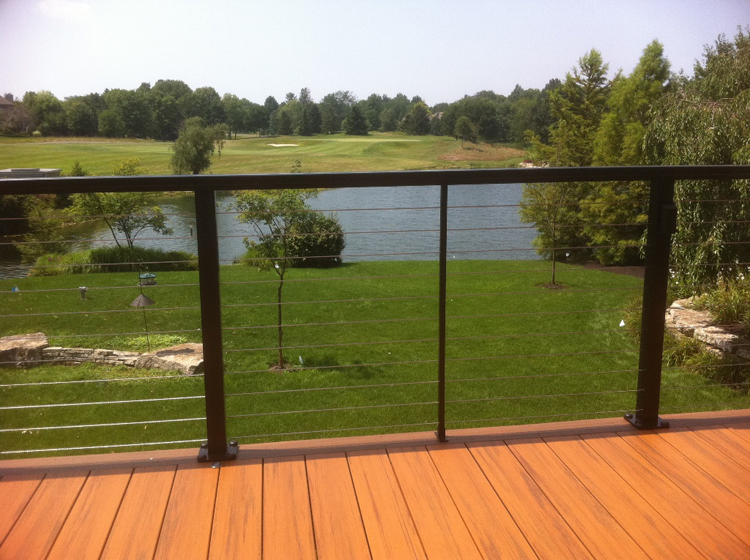 Archadeck of Columbus was able to offer quality craftsmanship and make anew for these Dublin, OH homeowners. 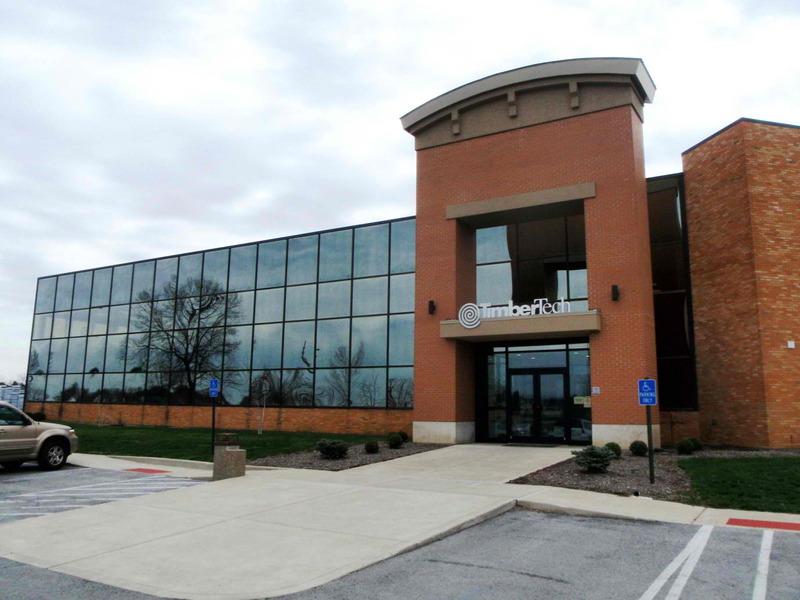 We installed a new 3/16″ thick rubber roof to ensure stability since the new TimberTech Evolutions deck has the capability to expand and contract. The homeowners chose a beautiful teak color, called “pacific teak”, in the Earthwood Evolutions series by TimberTech for this new deck, and accented it with a stunning pacific walnut picture frame perimeter and parting board. 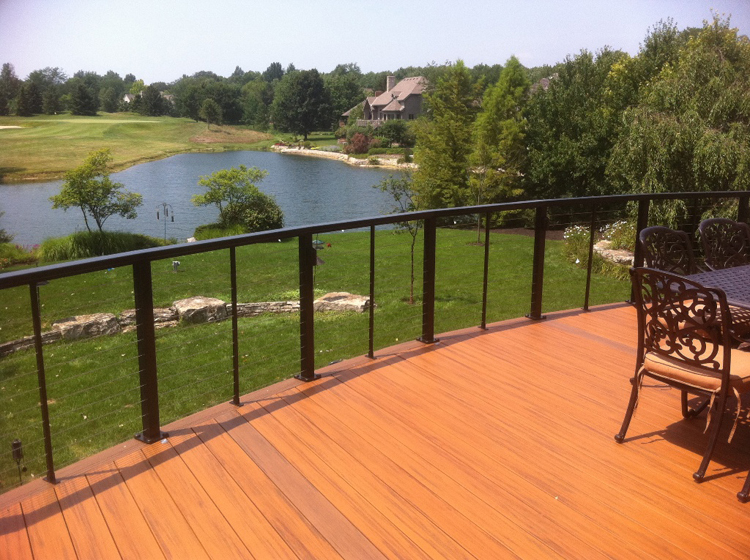 Instead of using wood posts on the new deck, we used black aluminum and we replaced the cable railings with brand new Feeney cable railings to enhance the view. The under deck-drainage system as well as the installation of the 40 watt low voltage lighting system for the in-deck lighting and rail lighting was completed by a company called Quality Edge. The finished product not only promoted the structural soundness of the construction that we stand behind tried and true, it came out quite beautiful. Easing the blow of the discovery of the damage caused by the previous builder and giving these homeowners peace of mind at a time when they need it most. Another view from this gorgeous deck in Muirfield village. 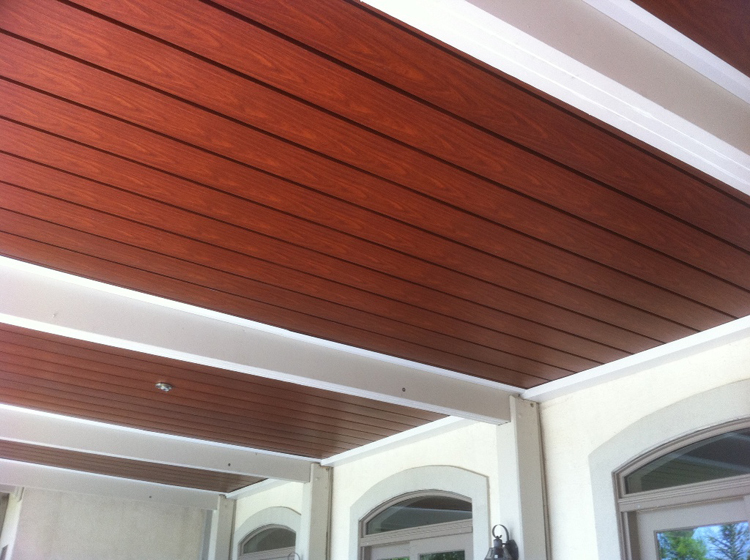 The under deck drainage system is called InsideOut, and is manufactured by Quality Edge as well. This product comes in various colors, of which these homeowners selected the wood grain appearance which is a very nice contrast to the wall of the house. These homeowners now have a completely dry space under their existing deck. No more worries and plenty of new deck space to enjoy. This photo shows how all the elements harmonize together, from the Pacific teak, to the pacific walnut, it all fits perfectly. The finished deck measures out to an abundant 950 square feet of wonderful living space to enjoy. The access points of entry for this deck flow from the sunroom and also the master bedroom. Archadeck of Columbus also rebuilt the stairs, which had an adjacent stone wall and we applied a new concrete cap to that area as well. These homeowners in Muirfield village now have a properly constructed and stunning which overlooks the golf courses at Muirfield, as well as the pond. 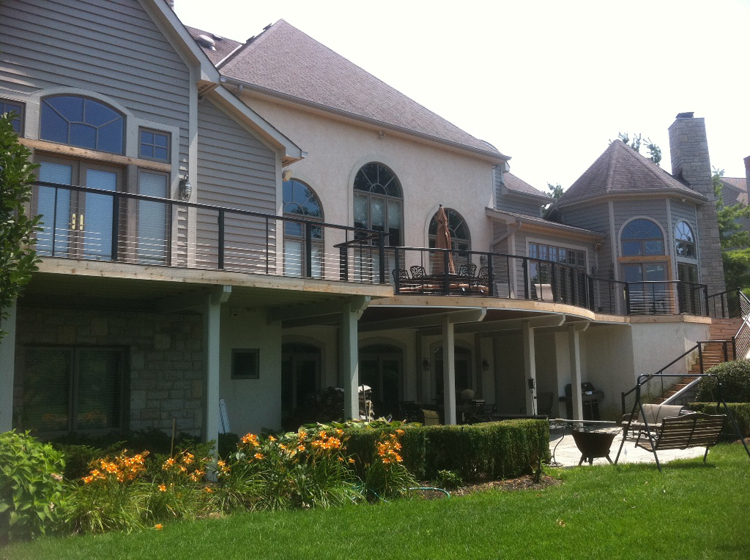 We were able to give them more than just a new deck, we also gave them peace of mind. Enjoy a video of this finished project. Author archadeckofcolumbusPosted on August 3, 2011 August 5, 2011 Categories Deck Builders Columbus Oh, Deck Builders Columbus Ohio, Decks, Radius deck edging, Re-deckingTags Decks overlooking gold courses in Dublin OH, Dublin OH decks, Inside out drainage systems by Quality Edge of Columbus OH, Muirfield Village custom decks, Quality Edge landscaping Columbus OHLeave a comment on In Dublin’s Muirfield Village, a TimberTech deck is perfect for this golf course community living.